1636. Selden's Reply to Grotius Selden, John [1584-1654]. Mare Clausum Seu De Dominio Maris Libri Duo. I. Mare, Ex Iure Naturae seu Gentium, Omnium Hominum non Esse Commune, Sed Dominii Privati seu Proprietatis Capax, Pariter ac Tellurem, Esse Demonstratur. II. Serenissimum Magnae Britanniae Regem Maris Circumflui, Ut Individuae Atque Perpetuae Imperii Britannici Appendicis, Dominum Esse Asseritur. Accedunt Marci Zuerii Boxhornii Apologia pro Navigationibus Hollandorum Adversus Pontum Heuterum, Et Tractatus Mutui Commercii & Navigationis Inter Henricum VII. Regem Angliae & Philippum Archiducem Austriae. London [i.e. Amsterdam? ]: Iuxta exemplar Will. Stanesbeii pro Richardo Meighen, 1636. [xxiv], 504; 61,  pp. Woodcut text illustrations, two copperplate maps, two woodcut plates. Complete. Octavo (6" x 3-3/4"). 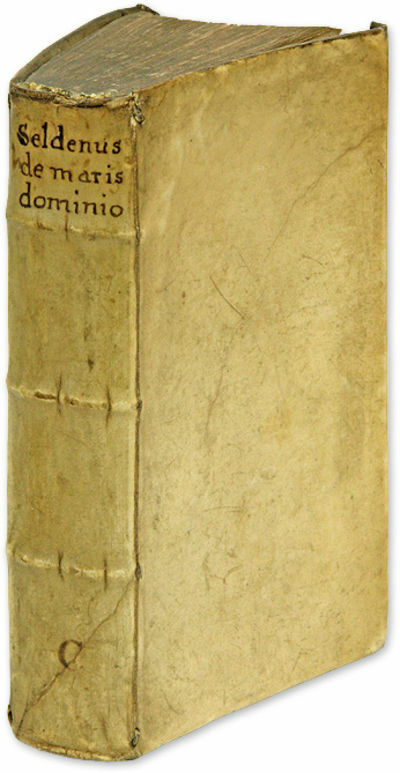 Contemporary vellum with lapped edges, raised bands and early hand-lettered title to spine. Light soiling, small chip to head of spine, corners bumped, later woodcut portrait of Selden affixed to front pastedown, free endpaper removed, recent bookplate to front endleaf. Title page printed in red and black. Light toning to text, slightly heavier in places, early owner signature to title page, early annotations to verso of facing endleaf. A nice copy. $750. * Second edition, one of three issues from 1636. Selden's Mare Clausum (Dominion of the Sea) is the most famous British reply to the argument of Grotius's Mare Liberum, which denied the validity of England's claim to the high seas south and east of England. Selden argues that England's jurisdiction extends, in fact, to all waters surrounding the isles. "Like all the works of Selden, the book is of tremendous erudition.... It is not like Grotius's work, based on large philosophical principles, but it exhibits a vast historical knowledge, and is fortified at every point with authority from record, statute, case-book and chronicle. ": Fletcher, John Selden 1584-1654 (Selden Society Lecture, 1969) 10-11. English Short-Title Catalogue S123287.